The client, who has had a stroke, wanted to be able to continue caring for her horse, but was unable to carry its feed to the paddock as she only had use of one arm. 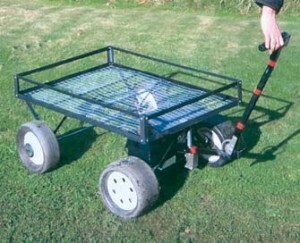 An extra set of wheels was added to a motorised golf trolley to enable it to support a flat base of aluminium “L” section and metal netting. The original handle was reversed and fitted with a “dead man’s handle” control. The trolley base also has a hole for a water bucket. The client is now able to take feed and water to her horse independently, and also remove the dung using the same equipment.